This is Not a Pipe. The cat sat on the mat. Surrealism has always been a bit too clever to be great art. Very engaging and striking and fun, but maybe a bit too self-consciously cerebral to qualify as truly great. Magritte was one of the better surrealists. He produced some beautifully memorable, witty images that have become part of the modern visual imagination. Behind all of those images was a very profound, serious project, and surrealism is in many ways more a conceptual activity. Take the painting of the pipe above, with 'This is Not a Pipe" scrawled beneath it. Yes you could see it as just some silly joke, but Magritte like other surrealists was always playing with the idea of representation. He wanted people to question what they perceived, and the underlying idea behind representation, that a representation in some way 'stood for' the thing. The painting itself is not a pipe. 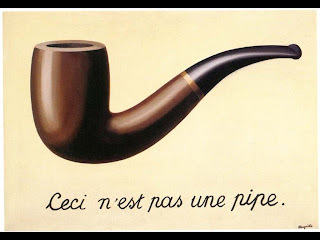 So the statement "This is Not a Pipe" is actually correct, it's not a pipe, it's a painting of a pipe. And the sentence isn't an ordinary label for a diagram above it, because it's actually a painting of a sentence. And when the sentence says 'this is not a pipe', what this is it referring to? The painting of the pipe (is not a pipe)? Or the sentence itself (is not a pipe)? Or the entire painting (including the sentence) is not a pipe? Magritte in this simple-looking image is unravelling the entire representative schema of words-and-world. Foucault wrote a very short, beautiful book using this as a theme, brilliantly teasing apart this painting and other Magritte work in an exploration of the nature of representation, or more simply the true relationship between words and the world. 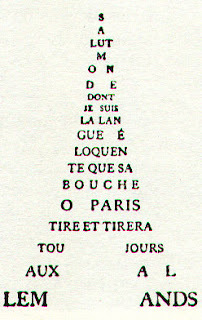 He realised that the word-world relationship was nicely described by the calligram, where the image is itself made of words, as in Apollinaire's famous example below. On the page of an illustrated book, we seldom pay attention to the small space running above the words and below the drawings, forever serving them as a common frontier. It is there, on these few millimetres of white, the calm sand of the page, that are established all the relations of designation, nomination, description, classification. Thinkers have spent hundreds if not thousands of years trying to understand the relationship between words and the world, famously and often captured in the example of "the cat sat on the mat". What relationship does the word 'cat' have with an actual cat, sitting there on the mat? You can see that this is exactly Magritte's theme - just replace the cat with a pipe. 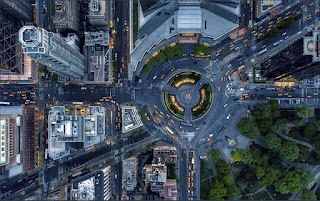 The same questions reappear in science in the attempt to understand how mathematics represents reality - maths and the world, instead of words and the world. Scientists (particularly physicists) wax lyrical about God being a mathematician, and wonder with awe how their equations represent the truth of how the world works. The thing about the representation question is that it's completely simple to answer. So simple that it's obvious the only reason it still exercises fine minds is that they're too close to it. They can't see what's right under their faces. Words don't represent anything. Maths doesn't represent nature. Pictures don't represent pipes. As I went on about in an earlier post, representation is actually re-presentation. You present some thing again, in another format. There's no mystical relationship between the re-presentation (e.g. a pipe as a painting, or a painting of a pipe and a sentence about the painting) and the thing itself. 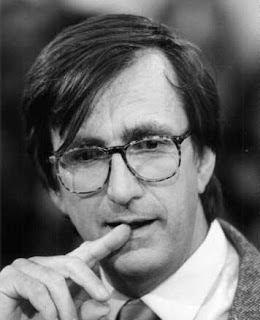 But there is a relationship of some sort, so that if I use the word 'cat' to refer to a living, breathing cat, everybody knows what I mean because through a whole set of practices and institutions, it's something that becomes second nature. It's all of those practices and institutions that bridge the gap between the word and the thing. They're what re-present it. That will include schools, where we all learn to use language and associate it with real world things, and also our families. So if we all learn to use the word 'cat' to refer to the actual animal, through learning to speak with our parents and then in school, then we all knw what we mean. At no point does the word enter some metaphysical zone and suddenly access the 'true catness' of the cat. It's just a sound (or a set of lines, if we're talking about the written word 'cat'), which through habit we learn to associate with the real thing. It's an association, that's all, a re-presentation of something in another way. The same applies to formulas and equations in science, they don't 'represent' anything at all, in the sense of somehow capturing something in its essence. They re-present reality, via a whole set of instruments and practices. You can't apply Newton's laws of motion without a stopwatch and a ruler of some sort - the post about materialism again. It's the rule and the stopwatch that re-present the moving object on the page, where the maths can then apply. One of the consequences of swapping representation with re-presentation is that it changes how we understand words and language in everyday use as well. Generally we think language is used for communication, to transfer information. That turns out to be not quite what's going on. Next time. Think you're being a tad unfair to Magritte. He had much more talent and wit than the pedantic Breton, and more rigor than Dali knew existed. His best works still stand up astonishingly well especially when juxtaposed with all the pretenders trying to ape his genius. But then I'd argue that there's nothing wrong with being self consciously cerebral if you have the wit to disarm the pretentiousness. Which is why I'd vote for Magritte and Bunuel as the two great surrealist artists. A sense of humor, as well as style. Hey, I said he was one of the best (better) surrealists. I think if you're going to be clever then you need the wit, like that Dorothy Parker blog. It is an interesting one for me though, whether cleverness in art is ever 'great' art, even with the humour-shield. Cleverness is an ingredient, like any other you might want to throw into the mix. Some people can't stand James Joyce, or 'intellectual writers' like Robbe-Grillet, but being intellectual or clever isn't a reason to get kicked out of the pantheon. While I'm inclined to the 'simple is better' side of art, seeming simplicity is often incredibly clever. Just look at Monet doing a haystack or a water lily. It just hides its tracks better and purports a lack of ostentation, but then it's just a question of whether you can see the stitching or how cleverly it's been hidden. Whatever, Monet plays with light in a way that shows he's intellectual and clever as well as intuitive. It's perhaps easier to hear in music where the abstraction can be as clever and intellectual as you like, or as emotional, all wrapped up in a piece by Bach. The thing I like about Magritte is you can be an eight year old or eighty and still get a good whack over the noggin by looking at him. Whether it's great art in a Leavisite sense I'll leave to others, but it's great to look at. Whenever there's a Magritte in one of those American galleries that's looted Europe, the eye always gravitates to the work. cheers. I'm a bit of a Kafka person on art. It has to create a world, a universe. To anticipate a world-to-come, to lead people there. That could be a simple or complicated thing, but to be 'great' it has to resonate in that bigger way. It has to speak to as many things and emotions and ideas as possible, rather than to some concept. That's often why 'pop' seems to me to be almost the most profound art. Magritte probably verges on it, for the reasons you say - it jumps out at you, drawing you in. But once it does is it saying much? Not so sure. It's certainly saying some clever and witty things, but I'm not sure it's creating a world.